Wall fronts the new office building at 601 Massachusetts Ave. 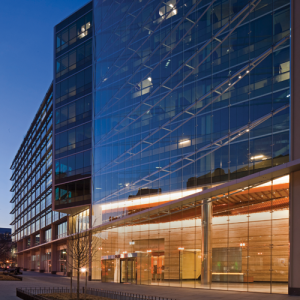 In the heart of Washington, D.C. Harmon Inc. served as the installer, and W&W Glass LLC was the system supplier for the 113-foot-tall point-support atrium wall—the Pilkington Planar system with ½-inch Pilkington Optiwhite low-iron monolithic tempered glass. The wall is supported by stainless steel tension rods and 86-foot wide horizontal painted steel trusses bracing the system at each floor. The architect for the project was Duda Paine Architects, the developer was Boston Properties, and the contractor was Clark Construction. TriPyramid Structures Inc. fabricated the trusses to very tight AESS tolerances, according to W&W Glass officials. “Lead times for product have improved on some supply fronts and have increased on others,” adds Bob Massey Jr., CEO for No. 13 Massey’s Plate Glass & Aluminum Inc.